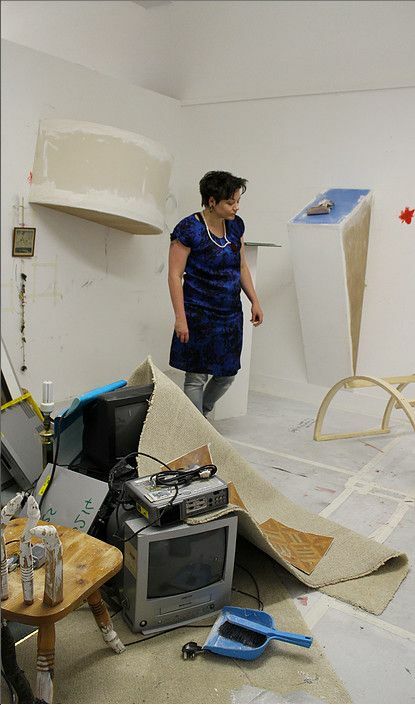 Louise Bradley is an art psychotherapist who uses found objects, videos, photography and sculpture to connect external and internal landscapes. Louise Bradley’s experimental practice takes us on a journey of personal language and self-expression. As an art psychotherapist she connects internal and external landscapes using found objects, videos, photography and sculpture. Her work embraces aleatoric method by free drawing and writing as well as collecting. Her installations represent emotional states of mind as well as having a link to physicality and identity. She is a part of a collective of art psychotherapists called ‘Interplay’ who exhibit together annually. In 2017, Louise Bradley qualified as an art psychotherapist MA from the University of South Wales. Prior to this she studied fine art BA at Southampton Solent University, qualifying in 2013. Bradley was selected for Bloomberg New Contemporaries, awarded an emerging artist bursary by Arts Council England and secured a residency in the Solent Showcase Gallery (all 2014). Currently Bradley is living in Bristol as a practising artist at Spike Island studios as well as working as an art psychotherapist.